If you are a web designer, or an app developer or a creative professional looking for freelancer work over the internet you must be aware of the ways people approach their potential clients and get in touch with them. The clients often need a proof of your past work experience and for a professional who is working as a freelancer, the best proof can be the portfolio that consists of all the best past works from the freelancer. You can create a portfolio website for this. A portfolio website can be useful as a place where you can showcase your work and attract your potential clients. Here are some steps that will help you in developing a portfolio website. There is a variety of platforms to set up your portfolio website. All these platforms have their own pros and cons. WordPress is still one of the best options though. On WordPress you will find a wide variety of themes, templates, and plugins. You can customize your website however you want. It will offer you the flexibility to modify it in the future without much fuss, even if you don’t know how to code. A domain name is essential to your personal branding. It will feature in your profiles across your social media accounts and any website where any of your work is being featured. It must be easy to spell and remember. No matter which name you choose, the point is to make sure that it’s something that your clients can easily remember when they want to check you out. Once you finish working on the framework of your website, you can focus on the theme. Design the website with utmost care as it is something that is going to be presented to your potential clients. WordPress offers you thousands of themes. See what looks good for your website and also suits your overall theme and personality. No matter which theme you choose, make sure it’s mobile-friendly. A large proportion of clients will be checking your website using their smartphones. You will need to make sure they don’t have any problems with the layout or functions of your website. SEO is a combination of a wide range of factors and it can overwhelming at times. Include keywords that are related to your services. Yoast has all the features that you can use even without technical knowledge. Your social media profiles are important components of your brand. Links to your profile on the homepage and all other pages and will make them visible enough that the visitors can will be able to find them and contact you. Make sure you include all the best testimonials that you have received in the past as they will be instrumental in the way your potential clients make a choice of giving you a project. You can ask your clients to give a short testimonial and their experience of working with you. These testimonials will go a long way and help you a lot. You will have to be careful in considering the hosting plan that you choose. When you are comparing hosting plans, the most important stats are the storage space, speed, and transfer bandwidth. Because we are talking about a portfolio website here, the most important will be the speed. The storage allocation for your portfolio website will be just enough, so you will not have to worry too much about it. The web developer you work with can help you with this. Once you have your website up and running, doesn’t mean that your work here is over. You will have to save your website from hackers and other thieves that will be trying to steal information from your website. You will need to take control of your website. Take precautions and create complex passwords which are difficult to break. 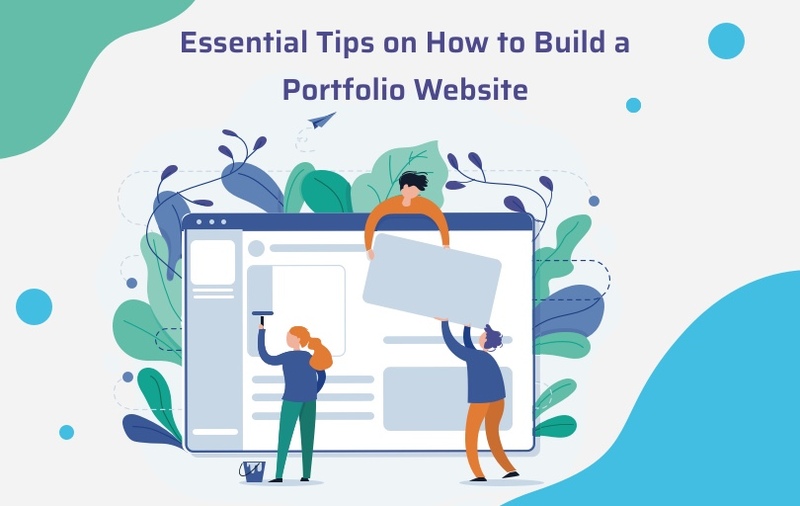 An online portfolio website is an essential part of your freelance strategy as it will get you in touch with your potential clients and will also improve your visibility in the online market. Whether you are a web developer, app developer, or writer, having a portfolio website will definitely help you. Keval Padia is a co-founder of Nimblechapps, a prominent mobile app development company based in India. He follows different tech blogs and current updates of the field lure him to express his views and thoughts on certain topics.